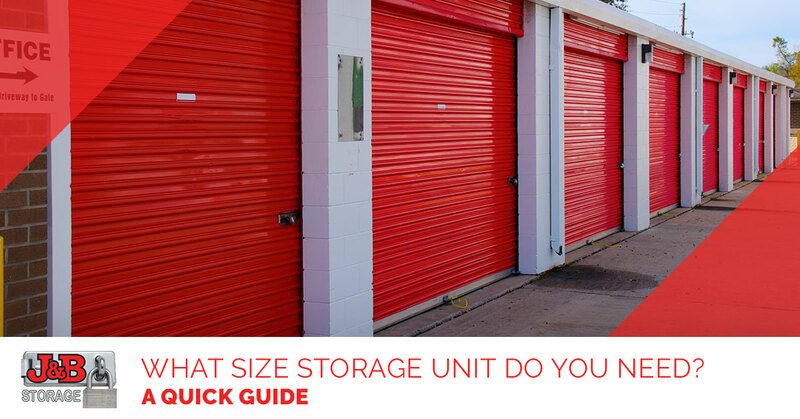 When it comes to picking out a storage unit, one of the biggest decisions you will need to make is what size you want. Here at J&B Storage in Loveland, we offer a variety of sizes with something to fit almost any need. Whether you are simply putting up the holiday decor or you are using your storage unit to hold your belongings between moves, we can help you find the perfect unit for your needs. Check out this quick guide to choosing the right storage unit to ensure that all your belongings fit comfortably. The following are some of the most common storage sizes on the market. Be sure to check with us to find out what sizes are currently available on our property. 5×5 Storage Unit: The smallest unit size offered, a 5×5 storage unit is approximately the size of a closet. Inside this unit, you can fit small furniture, a few small boxes, and odds and ends. This is the ideal size if you just have a couple extra items to store. 5×15 Storage Unit: Slightly bigger than a 5×5, this unit is akin to a walk-in closet. You can fit a few furniture items in this space and numerous medium to large-sized boxes. If you are storing an extra bedroom set, this space will likely suffice. 10×10 Storage Unit: A significant upgrade, a 10×10 is around the size of half of a one-car garage. You can fit quite a bit of furniture in here, making it ideal if you are storing a couple extra bedroom’s worth of belongings between homes. 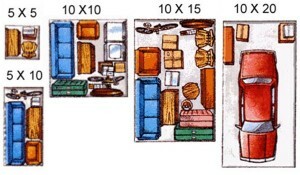 10×15 Storage Unit: Slighting smaller than a one-car garage, a 10×15 will hold multiple rooms worth of furniture. You can store bigger items, such as pianos, large desks, couches, and other bulky furniture. For businesses who will be storing extra equipment, this is a great size unit. 10×20 Storage Unit: Around the size of a standard one-car garage, this is the first unit that can fit compact vehicles. This space is adequate for holding belongings from multiple bedrooms and can fix extras such as washers, dryers, and other appliances. 10×25 Storage Unit: If you are between homes and you need to store almost everything you own into one unit, this might be the space for you. Slightly bigger than a one-car garage, you can fit mattresses, couches, dresses, dining room sets, entertainment centers, and more. This is also adequate space to store a vehicle or boat. 10×30 Storage Unit: The size of a one and a half car garage, this unit is adequate for storing even larger vehicles or boats. This is a great unit for commercial uses, as it offers a large amount of room for organization. The above guide gives you a rough idea of the space you will be working with depending on the size you choose. As you think about what size is right for your needs, ask yourself a few questions. How long will I need this unit for? Will I be adding more belongings down the road? Do I need easy access to my items while they are stored? During the winter months, do I want to store any vehicles, boats, or outdoor items? Keep in mind that it will be far less of a hassle for you to rent a little extra space now rather than to move into a bigger unit down the road. If you need help deciding on the right size storage unit for your needs, we invite you to visit us at J&B Storage in Loveland. We will be happy to show you around the units we have available and to give you our advice on the right pick for your needs.